The Ashambu or Agasthyamalai hills form an imposing backdrop over Kanyakumari. Kanyakumari is best known as a pilgrimage site, where every good Indian will visit to bathe in the three seas, visit the Swami Vivekananda temple and pay respects to the temple of the virgin goddess who the tip of the peninsula is named after. I appreciate these aspects but for me Kanyakumari is where the Western Ghats begin (or end, depending on how you look at it). On this visit my focus was on experiencing the monsoon from the eastern rain shadow where its drama can be appreciated without actually being caught up in the mist, deluge and whatnot. 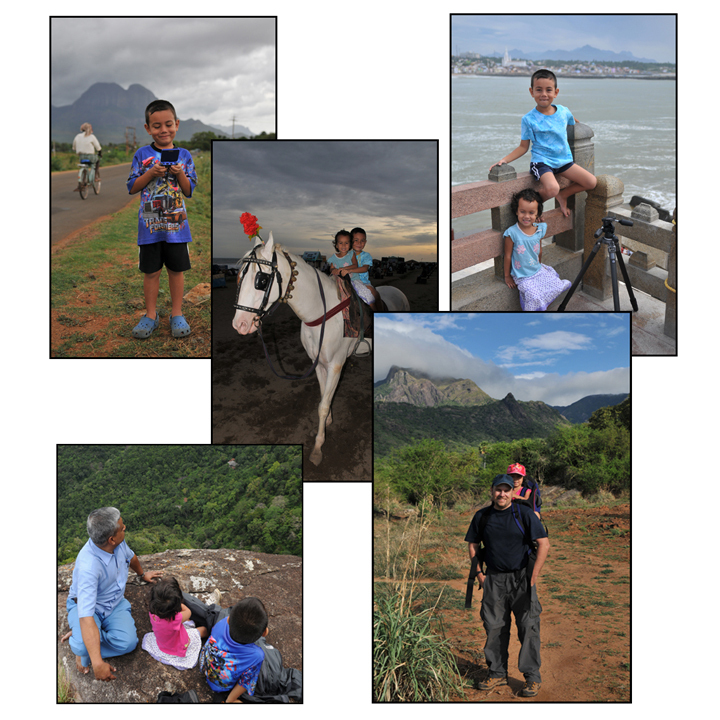 I wanted to share the experiences with my two young children but I was alone, as my wife Raina was studying in Thailand. Using a mix of public transport and taxis and managing boisterous (and then sick) kids, camera gear and regular baggage on my own became a significant challenge. Kanyakumari was abuzz with festive visitors, many who had been given an extra holiday as a part of the World Classical Tamil conference in Coimbatore. 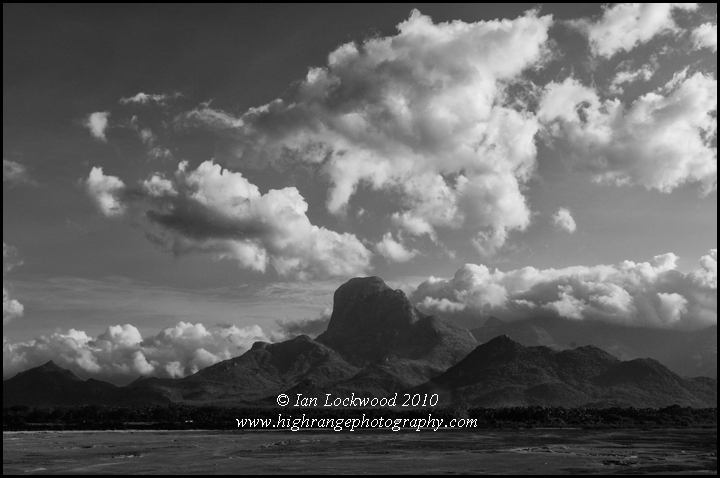 The monsoon had already been active for two weeks and there was drama in the clouds and hills. We experienced this from the Swami Vivekananda rock, Vattakotta fort and Maruthuvazh Malai (Medicinal Hill). 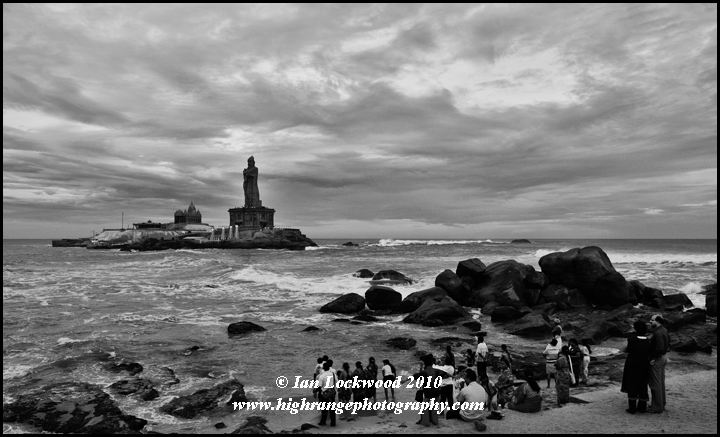 Pilgrims and visitors at the confluence of the three seas with the Thiruvalluvar Statue and Swami Vivekananda island under the South West monsoon. On our return home to the Palani Hills from Dhonavur the South West was bubbling over the mountains and even raining on the dry plains. We took the long way through Tenkasi, Rajapalaiyam and Srivillaputtur to experience an intimate feeling of the eastern face of the Western Ghats. 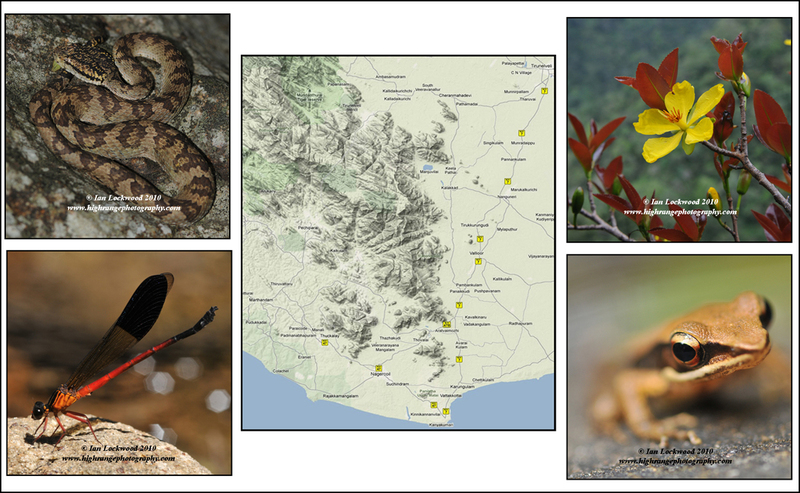 Diversity in the Naraikadu area (clockwise from upper left): Malabar Pit Viper (Trimeresurus malabaricus), Map showing southernmost Western Ghats near Kanyakumari (source iPhoto/Google maps), Unidentified flowering tree (family Ochnaceae ?) at David’s Rock (elevation 1000 m), Bronzed frog (Hylarana temporalis) below Naraikadu, Endemic damselfly (Euphaea cardinalis) at stream (elevation 800 m). For the second part of the trip we returned to visit our friends at the Dhonavur Fellowship to spend a pleasurable week appreciating the biodiversity and landscapes on the plains and in the hills. Our daughter Amy is named for Amy Carmichael who founded Dhonavur and had the wisdom to protect the Naraikadu forest in its natural glory. It remains an unusual example of a private forest area in an Indian protected area (KMTR) but retaining some of the finest forest in the area. 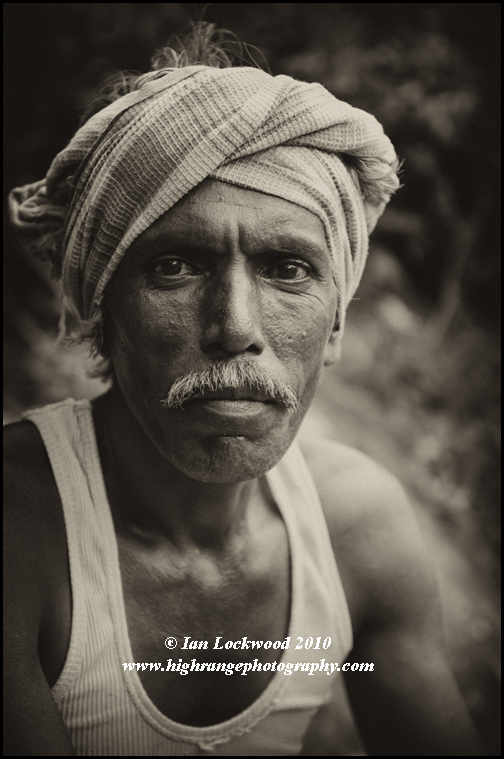 I came to the area in the mid-1990s as I worked to document and understand the landscapes and ecology of the Western Ghats. In 2001-02 I made three memorable trips with the Fellowship to the Agasthyamalai area culminating in a night on the summit in April 2002. As usual, my children and I were treated with the utmost hospitality from our friends. Soon after we arrived in Dhonavur we were joined by our friends Bob & Tanya from the Vattakanal Conservation Trust. Thiruvanamalai, one of the most spectacular mountains in the Ashambu/Agathyamalai hills. The Fellowship’s location at the foot of the southernmost Western Ghats is sublime. The campus, designed in a unique Sino-Travancore blend, sits on the red-earthed plains amongst groves of tamarind, neem and banyan trees. The structures are built with fired bricks and tiles and a series of arches highlight Amy Carmichael’s early links to China. Their hospital, church, clock tower and other buildings fuse into the landscape as if they had metamorphosized out of the soil. A little to the west rugged mountains arise in a dramatic riot of granite, with scattered patches of forest and grasslands. As with the rest of the Ashambu or Agasthyamalai Hills, a dizzying array of vegetation is packed into the east-west profile of the mountains. This forms the southernmost parts of the expansive Kalakad Mundanthurai Tiger Reserve (KMTR). Thiruvanamalai, Mahendragiri and the nearby ranges under a monsoon rainbow. Mahendragiri (1,654m) commands the heights of hills and is often enclosed in a misty hallo. However, it is the prominent Thiruvanamalai that captured my attention. This is a mountain that was drawn by Thomas and William Daniell on their seminal journey though southern India documenting landscapes and monuments in the late 18th Century. A view of Thiruvanamalai (sketched from “Kalakkadu”) appeared in their collection Oriental Scenery and has been reproduced in Antonio Martinelli and George Michell’s 1998 book with the same name (Timeless Books, New Delhi p. 170-171). Most interesting to me is that Thiruvanamalai hosts the southernmost populations of Nilgiri tahr (Nilgiritragus hylocrius), something that has been documented by A.J.T Johnsingh and members of the Dhonavur Fellowship. Of interest to birdwatchers in Sri Lanka is the fact that G.M. Henry had a fruitful trip to Dhonavur in 1936, something that is described in the intriguing book Pearls to Paintings: A Naturalist in Ceylon (edited by Christine Johnson, WHT, Colombo, p. 92-93, 2000). Michael is a true ‘mountain man’ and has worked with the Fellowship over many, many years. He knows the mountains like no one else, something I appreciated when he helped our group on the Agasthyamalai summit trip in 2002. Since its inception the Dhonavur Fellowship has been meticulous about keeping weather and rainfall records as well as a full diary of wildlife and natural history sightings. 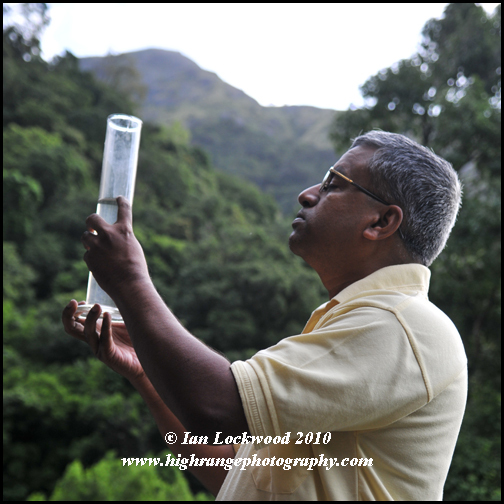 Here, Ezekiel Rajamanian is recording the rainfall from the previous 24 hours at Naraikadu. Scenes from the Kanyakumari-Dhonavur monsoon adventure: Lenny, Amy and their father (and annachi Ezekiel).